Let me introduce the Samsung AddWash. This ingenious appliance is nothing short of inspired and, for me, it was love at first sight. My colleagues, however, took a little more convincing. For anyone that’s ever forgotten a sock, discovered a T-shirt under the bed or had a child vs. food disaster just after popping on a wash (at least one of those domestic atrocities befalls us all on a semi-regular basis) it’s the perfect solution. Of course, the most prominent plus to this wonderful machine is its door – more specifically, the smaller door fitted in the middle of the usual big one – but there is a multitude of innovations that will, without exaggeration, revolutionise the way you wash. It does indeed stretch up to a 4-figure price tag should you want the full AddWash experience but, with even the low-end models incorporating the eponymous door and a handful of exclusive Samsung Smart features, it’s worth every penny. I have already mentioned that the AddWash includes a super-nifty mini-door. It incorporates some pretty impressive technology too. 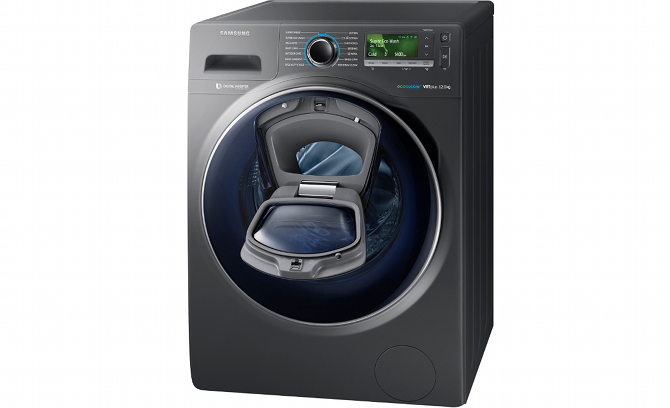 Whilst app-controlled washing machines are no especially new thing, Samsung has created an incredibly intelligent, highly functional mode of operation as part of their Smart Home control hub, aiming to streamline daily life. It gives you the tools to start winning the ever-precarious game of work/family/social life Jenga we all know too well – and you’d be surprised just how much time is taken up by something as simple as getting a load done. You can easily start, stop, pause, set and monitor a cycle from the bus, work or your sofa (we all would if we could) and with an array of alert options to keep you informed on the progress of your chosen programme, you can plan your washing around your day instead of vice versa. As well as simply being the best for time efficiency, there are chat controls within the app. This was an initially mystifying feature; what it actually does is allow your connected appliances to communicate your control preferences between them, creating a pool of information that can shape your home into a smoothly ran world of utter amenity. This domestic utopia is, admittedly, still a little way off but the general principle is one to look forward to. Alongside this progressive smartphone control, the app also includes a clever little something called Smart Check. This device is more than likely to save you some serious money down the line, with the ability to detect and diagnose small issues before they become expensive, engineer-callout-grade problems. Most common complications can easily be sorted over the phone but if it comes down to an old-fashioned fix, your engineer can turn up with any and all necessary parts sans faff. The tech poured into the development of this machine is some of Samsung’s best. As well as striving for more effective efficiency – a common cause amongst modern manufacturers – you get some incredible clothes care as a product of their efforts. The exclusive Ecobubble is a phenomenal leap in terms of how we wash; by mixing detergent and water together inside the drum before the cycle, the thoroughly blended solution is quite literally fizzed into your clothes to deeply penetrate fibres and deliver a wash as comprehensive as it is gentle. The incredible brushless motor is another economical string to the AddWash’s already plentiful bow, coming with a promise of 10 years’ loyal service and a dB rating so low it barely encroaches into normal conversation levels – even at the apex of its most energetic spin. All of the machines in the range come with a frankly astounding A+++ energy rating, cementing that, if nothing else, it's sure to be merciful on your electricity bill. With such a deluge of tech incorporated into the AddWash, it's easy to overlook its remarkable array of programmes. Settings ranging from the expected cotton and wool wash right through to more specialised cycles - anti-allergy and baby care prove particularly useful - are, whilst seemingly simple, entirely indispensable. Ever been caught out by last-minute plans (or completely forgotten about them)? A choice of speedy cycles, featuring an especially helpful option that completes a full 5kg load (25 T-shirts in real-life terms) in just 59 minutes, is ready to save your day/evening/weekend. Alongside this, ground-breaking Ecobubble technology brings a large helping of substance to the table. Bubble Soak is proven to remove 20 of the most stubborn everyday stains – including red wine, blood, coffee, turmeric, engine oil and ketchup – with no pre-treatment, saving a tonne of time and a considerable amount of elbow grease that can be duly redistributed to doing more of what you love. Finally, I have arrived at the prodigious AddWash door. A pioneer in its own right and a simple answer to an ancient (or, at least, as old as wide-spread domestic washing machines – 60 years or so?) inconvenience, it’s a refreshing advance in the somewhat stale tradition of appliance design. With the power to pause the cycle at any point and simply drop items into the drum, it goes much further than showing an escapee sock who’s running the show. Even on a full load, a handful of T-shirts can be successfully dropped in without a hitch while delicates or clothes that only need a quick freshen-up can be popped in on the final spin for noticeable energy reductions. The whole range of machines is indisputably attractive to boot; a selection of monochromatic finishes offers tasteful modernity while the LED touch screen and sleek rotary dial lend the whole appliance an envy-inducing luxuriance. Samsung has undoubtedly outdone themselves. The AddWash is a homely triumph; from the dedicated design of the motor and drum to its astute door and alluring exterior, it’s a gratifying, justifiable indulgence. As considered as it is considerate, this washing machine has not only resolved an issue as annoying as it is recurrent but has introduced a method of washing (ref. the Bubble technology) that makes a real, tangible difference to energy consumption - but I was sold from the start.